According to a new study, the region’s wetlands are inhabited by 3,615 tree species–three times more than previously estimated, making these the world’s most diverse wetland forests in terms of tree species richness. The study was supported by the São Paulo Research Foundation – FAPESP and performed under the aegis of FAPESP’s Research Program on Biodiversity Characterization, Conservation, Restoration and Sustainable Use (BIOTA-FAPESP). The results published in the journal PLOS ONE include the most comprehensive list of wetland tree species produced to date. “The list with the names of all the species is the main contribution made by this survey, which is open access. It will serve as a basis for future studies to fill the gap in botanical knowledge of the region’s wetlands, especially on tributaries of the Solimões and Amazon rivers. If there were more inventories, the number of species could quickly triple again,” said Bruno Garcia Luize, first author of the article and a doctoral researcher at São Paulo State University’s Bioscience Institute (IB-UNESP) in Rio Claro, Brazil, who has a scholarship from FAPESP. “Prior studies focused only on whitewater inundation forests and floodplains. We included data for blackwater inundation forests, white sand savannas and mangroves, for example. Additionally, there is a very strong bias toward the Solimões-Amazon river system. We were able to add data for important effluents extracted from rare inventories of forests along the Purus, Juruá and Madeira, among others,” Luize said. For the researchers, the large number of tree species shows the importance of the role played by wetlands in creating and maintaining biodiversity in Amazonia. “This role has traditionally been assigned to the Andes, given the climate gradient there, but the fact that we found almost all families and genera to be well distributed, with species capable of colonizing wetland areas, suggests this ecosystem has been involved in the diversification process for a long time,” said Thiago Sanna Freire Silva, a professor in São Paulo State University’s Geography Department and coprincipal investigator of the project. The climate in Amazonia’s wetland forests is distinctly seasonal, with fluctuations between dry periods and heavy rain leading to floods, during which the trees may be under water by as much as 8 meters. Wetland habitats can therefore be considered environmental filters that select individuals and species capable of tolerating recurrent flooding and drought during their lifespan. 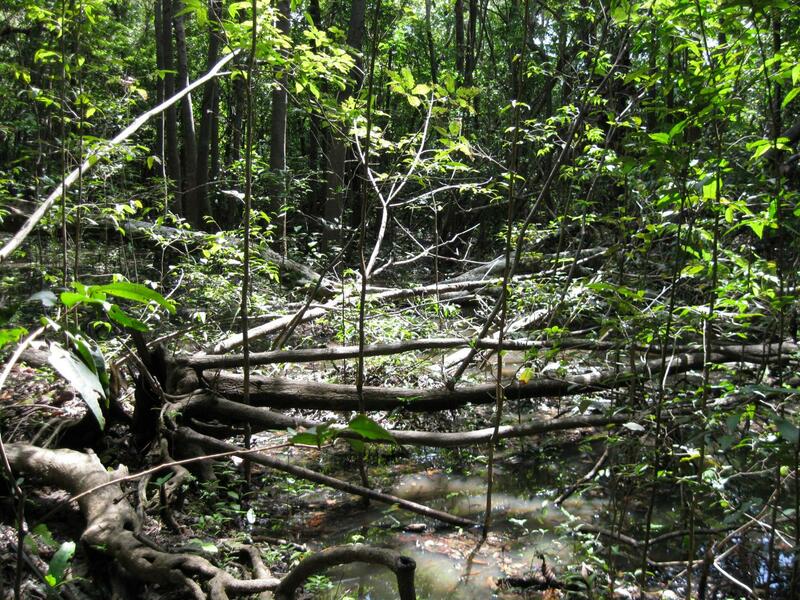 For the researchers at São Paulo State University (UNESP), the high proportion of trees in wetlands corresponding to 30% of Amazonia’s 7 million square kilometers is due to interchange between wetland and upland forest habitats. This difference suggests either that physiological adjustment occurs during the life of a tree or that the populations found in wetland areas have adapted to that environment. “As a result, we reach an extreme in which species are exclusive to wetland areas or only occur in upland areas,” added the FAPESP scholarship holder. The duration of flooding in wetland areas varies considerably from one year to the next. “When floods last less and are less intense, the composition of the tree species pool resembles that found in upland areas. However, once these species have developed flood tolerance, even if it is initially a low level of tolerance, the flood provides an opportunity for them to colonize new waterlogged areas. This can lead to specialization in wetlands by some individuals, which become different from upland individuals,” Freire Silva said. Trees may become increasingly flood tolerant or evolve new forms of seed dispersal via water or fish. “Species diversity grows over thousands of years, increasing the variety of niches available,” he noted. South America is considered the region with the largest area of wetlands, a vital ecosystem for the planet’s freshwater balance. The researchers stressed the importance of a better understanding of the variations in metabolic and physiological characteristics of both wetland and upland tree species. The main theme of Luize’s doctoral research is the influence of wetlands on tree species richness. He is currently at the University of Michigan in the US conducting a research internship abroad funded by FAPESP via a specific scholarship (http://www.bv.fapesp.br/en/bolsas/176249), studying the phylogeny of a specific Amazonian tree family, Lecythidaceae (which includes the Brazil nut tree Bertholletia excelsa), to understand this migration and adaptation of upland and wetland species.